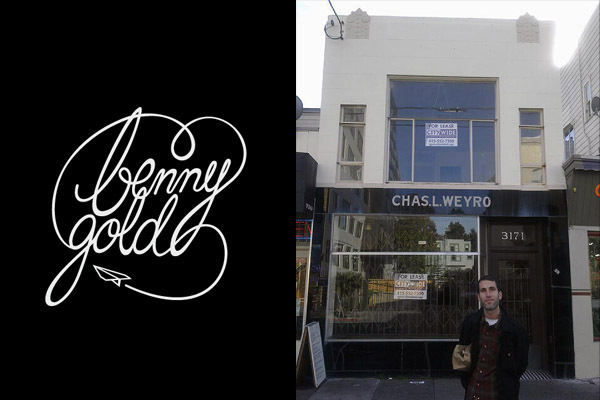 Congratulations go out to Benny Gold. The one man design team, skateboarder and brand owner recently signed a lease to relocate his design office and warehouse beginning January 1st. What began as guerrilla sticker hobby has evolved into a highly sought after freelance design business and full fledge clothing company. The brand has been tucked inside his residence for the past 7+ years and upon a brief visit back in November it was clear to see that Benny had out grown his single office space. I have a great deal of respect for the brand and Benny's integrity. Having the opportunity to discuss design and the brands growth back in November of last year, Benny mentioned his desire to expand with his heart set on one day having an external office and showroom/small retail space. What may be even more impressive is this dream has now come to fruition and has done so all on his own with no outside investment. By the looks of it the new space is a 2 story free standing building in the Mission District of San Francisco. And if memory serves me correctly I think the space is on 21st Street not to far from Self Edge San Francisco. Not sure as to whether there are immediate plans for a retail space but we would imagine it isn't to far off in the distance.